I was inspired to share this simple "Practice of Positivity" that my family does every night at the dinner table. 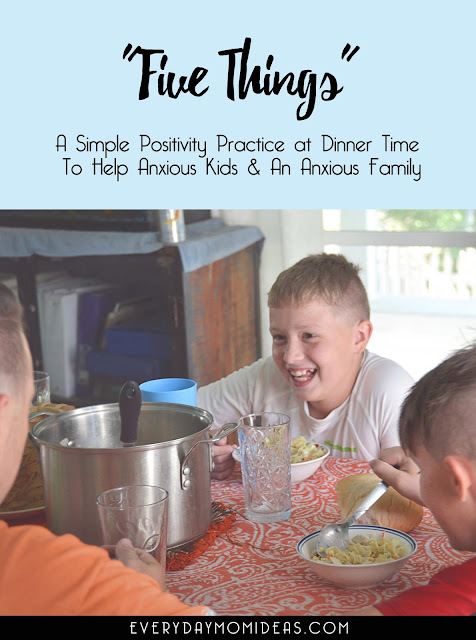 It has drastically improved our lives and especially the life of my nine year old who struggles with Anxiety issues, at a time when he and the rest of our family needed it the most. Now it has become a vital life skill/practice we can't do without. Four years ago we uprooted our two boys from their lives in the middle of the school year to move into our new home on the other side of town. We had not anticipated that the adjustment would be so hard on our children especially our oldest son who just turned nine years old. His world began slowly falling apart and we were fumbling at trying to help our wonderful son who was clearly struggling and going down hill. It was just little things at first. He would mention that he didn't know anybody and there was no one to play with at recess, also that they had already learned multiplication at this school so he had some catching up to do. Then the complaints got bigger and soon they tuned into break downs. And then the break downs started to happen at school... in the middle of class. We started to get weekly emails from his teacher about "incidents" and had to set up meetings with the teacher and counselors. He was coming unglued. The math wasn't coming to him and neither were the friends. For the first time in his life he no longer wanted to go to school and would beg me not to send him. My happy confident boy was gone and he soon exhibited extreme amounts of anxiety and would break down crying every single day after school. It became so bad over time that when kids were actually trying to make fiends with him he didn't even notice, because he had just decided it was all lost. We call it the "Doom & Gloom's". When you have a few bad things going on and you let them shadow everything else, so everything else seems bad to and you can't see any of the good. We were desperately working with the teacher and the counselor to come up with solutions to help him. Then one day my husband (who is a counselor for troubled teens) came up with the idea of "Five Things" at the dinner table. 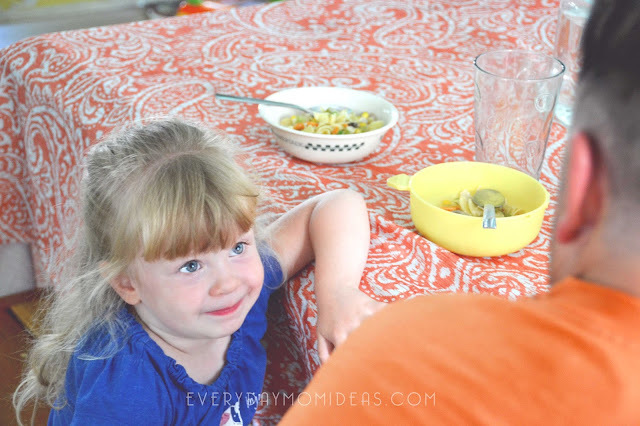 Every night at dinner we would each have to go around and tell five things that were positive in that day. And for the kids, one of the five things had to be school related. This changed everything! Not just for our son but for the rest of the family as well. It was so simple yet so impactful. A simple positivity/gratitude practice for the whole family. 1. At dinner each night everyone has to say five positive things about their day, or no one leaves. 2. You are not aloud to contradict the positive thing. Example: The weather was really beautiful today, too bad I didn't get to play out in it. 3. One of the five things has to be school related, if your a kid. 4. Who ever is the first one to say "My first thing is... " gets to go first or next. 5. Be respectful and encouraging during someones Five Things. 6. You are not aloud to help someone come up with their five things. They must do them on their own. 7. Your Five Things can be anything that happened in the last 24 hours. 1. By doing "Five Things" as a family it did not single anyone out, causing less stress and anxiety. My son did not know we started this just because of him, he just thought that this was a new thing mom and dad where doing because it would be good for the whole family. 2. 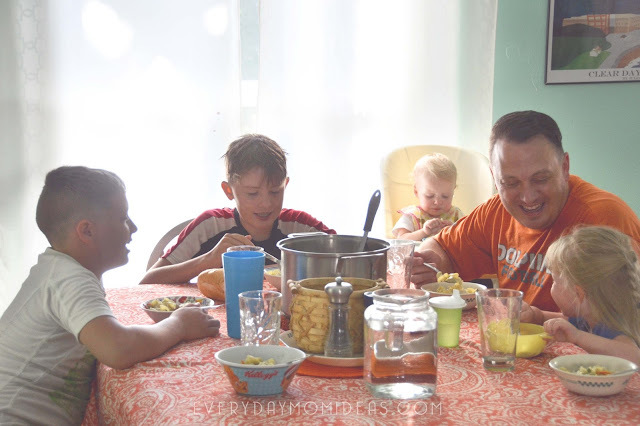 This is a simple type of gratitude practice that the whole family can get in on and share. A gratitude practice is an action you take to express gratitude. People who take the time to have a gratitude practice are more happy then naturally optimistic people who don't have a gratitude practice. Some other examples of a gratitude practice include, writing in a gratitude journal, name things that are positive for five minutes while out on a run, saying a prayer to your creator that only includes the things your are grateful for and not the things you need... ect. 3. Some days are easier than others but what we learn is that no matter how bad the day is, there was at least five wonderful things about it... no matter how BAD. How powerful is that! Being able to see the positive in each day is an amazing life skill no matter the age. 4. The "Five Things" positivity practice lessens daily anxiety issues and helps your family members see not so black and white. When we actively share and express positivity about our day, the next day looks brighter. Positivity Studies have shown that people who write down positive affirmations about their day before they go to bed, sleep better at night. 5. Bonus: It also doubles as a great way for us to hear details about each others lives that we don't normally hear about and is a great conversation starter. 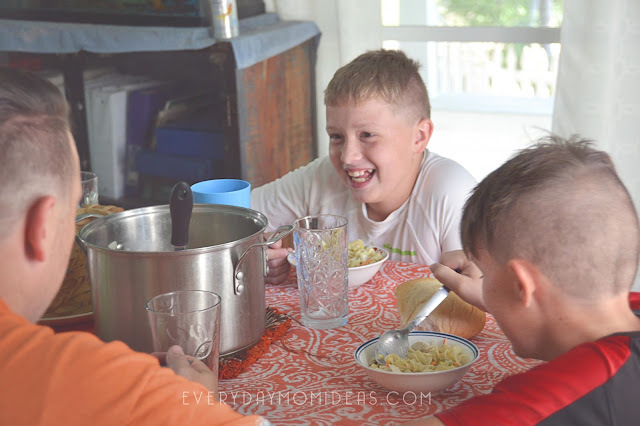 Imagine sitting around the dinner table at night and everything is revolved around beautiful happy stories that up lift and encourage each other. Thats exactly what this does. This practice does not cure everything, nothing does. But for our family it has made a massive impact not only on my son's daily life but all of us. 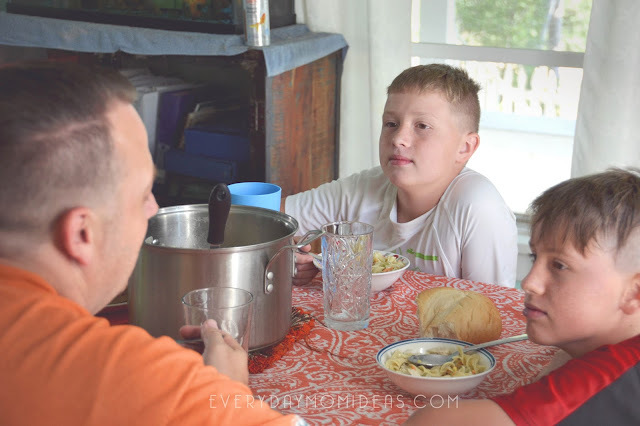 I realized that I to get in the Doom & Glooms and can let it take over my day, but when I sit myself down to dinner and know I have to be a good example to my children by naming ALL "Five Things" it changes my entire attitude and outlook. Within months of doing this positivity practice we were contacted by my sons teacher, this time it was good news! She noticed a huge improvement with our son at school and the melt downs had stopped. We almost hit the roof with joy! I know part of this success is him just acclimating to his new school but I also know a huge part of it was putting into place a simple system to help him see the good in each of his school days. This work is real, and no matter who your family is, if you take the time to add more love and positivity in your home, it's never waisted and you will see results. We have now been doing "Five Things" for over three years and it has become a family tradition and something we look forward to each night. It's just a natural part of our day now, and sometimes the best part of our day. Please share this simple act of positivity with someone you thinks could benefit from it. Below is a Pinterest friendly image for easy pinning and sharing.